Why? Your job, your profession, your entire industry may be gone in 1-2 years. Do you want to survive that? Do you want to get the most out of your time and resources? Do you want to operate your life most effectively? We are here to help! Why Use Audio For Email? How Can You Use a Holiday to Get Free Publicity? Do you use MindMaps to Evaluate Speeches? The next free Web Broadcast of "The League of Extraordinary Minds" is happening Thursday December 10th. In the League of Extraordinary Minds, Rich Schefren and Jay Abraham have assembled a group of the finest business minds available to answer your questions about your business. "Maximum Results From Minimum Efforts: Operating At Peak Performance To Get The Best Results From Everything You Do"
On December 5, 2009 the world lost a great mentor, philosopher, and coach. 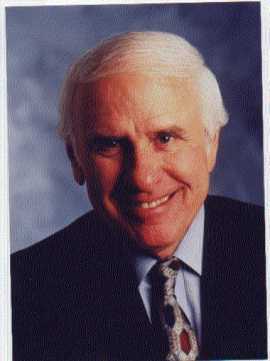 Over the past 46 years, Jim Rohn touched millions of lives through his seminars, books, articles, CDs, and DVDs. I was one of those millions. Jim has had a hand in shaping my destiny, just has he has done for countless others. Jim trained and profoundly infuenced many of the most influential personal development coaches of our time - including Tony Robbins, Brian Tracy, and Mark Victor Hansen just to name a few. If you haven't heard of Jim, it's not too late. You can still learn from his books, CDs and DVD programs at Jim's website. Do you watch streaming video? Would you like to save a lot of time doing so? To better help my clients, and to just plain survive economicaly, I must constantly learn a lot -- studying powerful paradigms, ways to optimize time and resources, ways to reengineer business plans and models, much more effective marketing techniques, and so on. I learn from modelling the masters. Some of that is via studying on-line streaming video courseware. That can be very time consuming and my time is valuable. One of the intense and extremely valuable on-line educational courses I'm currently studying consists of more than 30 sessions, each one consisting of about an hour of video, another 1-2 hours of Q&A video, 50-100 pages of supporting printed material. That's PER session. Photoreading and speed reading greatly speeds up my use of the printed material, but what about the videos? I recently found a software tool that instantly more than DOUBLED my productivity studying video. It installed it in just a few minutes and in my first 2 hours using it, I studied more than 4 hours of video! No learning curve, it's easy to use, and my results were immediate. Yeah, you read that right. More than 50 of the world's most brilliant business and marketing minds. All in one place. And all ready to help you achieve the success of your dreams. Who Knew The Stock Market Was Going To Crash? Don't get mad, get funny! Is The Stock Market Predictable?